Buddhism is not about either believing or not believing in God or gods. Rather, the historical Buddha taught that believing in gods was not useful for those seeking to realize enlightenment. In other words, God is unnecessary in Buddhism, as this is a practical religion and philosophy that emphasizes practical results over faith in beliefs or deities. For this reason, Buddhism is more accurately called nontheistic rather than atheistic. The Buddha also plainly said that he was not a god, but was simply "awakened" to ultimate reality. Yet, throughout Asia, it is common to find people praying to the Buddha or to the many clearly mythical figures that populate Buddhist iconography. Pilgrims flock to stupas that are said to hold relics of the Buddha. Some schools of Buddhism are deeply devotional. 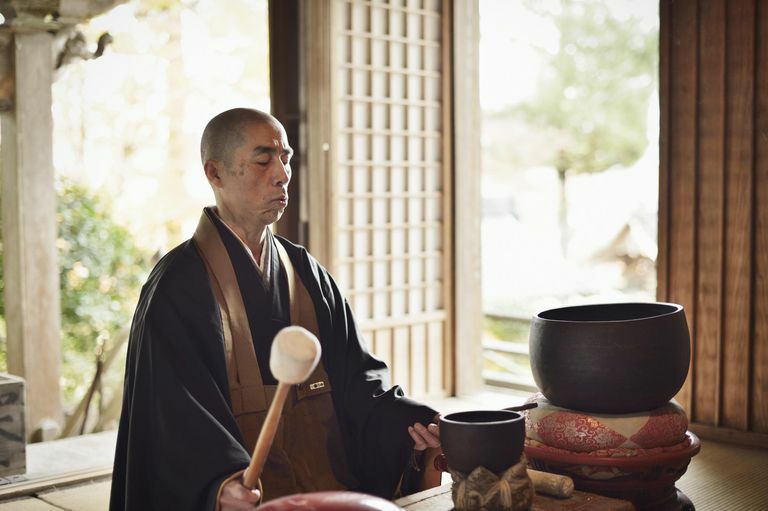 Even in the nondevotional schools, such as Theravada or Zen, there are rituals that involve bowing and offering food, flowers, and incense to a Buddha figure on an altar. Some in the West dismiss these devotional and worshipful aspects of Buddhism as corruptions of the original teachings of the Buddha. For example, Sam Harris, a self-identified atheist who has expressed admiration for Buddhism, has said Buddhism should be taken away from Buddhists. Buddhism would be so much better, Harris wrote, if it could be cleansed of the "naive, petitionary, and superstitious" trappings of religion altogether. I have addressed the question of whether Buddhism is a philosophy or a religion elsewhere, arguing that it is both philosophy and religion, and that the whole "philosophy versus religion" argument is unnecessary. But what about the "naïve, petitionary, and superstitious" trappings that Harris spoke of? Are these corruptions of the Buddha's teachings? Understanding the difference requires looking deeply beneath the surface of Buddhist teaching and practice. It's not just belief in gods that are irrelevant to Buddhism. Beliefs of any kind play a different role in Buddhism than in many other religions. Buddhism is a path to "waking up," or becoming enlightened, to a reality that is not consciously perceived by most of us. In most schools of Buddhism, it is understood that enlightenment and nirvana cannot be conceptualized or explained with words. They must be intimately experienced to be understood. Merely "believing in" enlightenment and nirvana is pointless. In Buddhism, all doctrines are provisional and are judged by their skillfulness. The Sanskrit word for this is upaya, or "skillful means." Any doctrine or practice that enables realization is an upaya. Whether the doctrine is factual or not is not the point. No gods, no beliefs, yet Buddhism encourages devotion. How can that be? The Buddha taught that the biggest barrier to realization is the notion that "I" am a permanent, integral, autonomous entity. It is by seeing through the delusion of ego that realization blooms. Devotion is an upaya for breaking the bonds of ego. For this reason, the Buddha taught his disciples to cultivate devotional and reverential habits of mind. Thus, devotion is not a "corruption" of Buddhism, but an expression of it. Of course, devotion requires an object. To what is the Buddhist devoted? This is a question that may be clarified and re-clarified and answered in different ways at different times as one's understanding of the teachings deepens. If Buddha was not a god, why bow to Buddha-figures? One might bow just to show gratitude for the Buddha's life and practice. But the Buddha figure also represents enlightenment itself and the unconditioned true nature of all things. In the Zen monastery where I first learned about Buddhism, the monks liked to point to the Buddha representation on the altar and say, "That's you up there. When you bow, you are bowing to yourself." What did they mean? How do you understand it? Who are you? Where do you find the self? Working with those questions is not a corruption of Buddhism; it is Buddhism. For more discussion of this kind of devotion, see the essay "Devotion in Buddhism" by Nyanaponika Thera. The many mythological creatures and beings that populate Mahayana Buddhism art and literature are often called "gods" or "deities." But, again, just believing in them is not the point. Most of the time, it's more accurate for Westerners to think of the iconographic devas and bodhisattvas as archetypes rather than as supernatural beings. For example, a Buddhist might evoke the Bodhisattva of compassion in order to become more compassionate. Do Buddhists believe these creatures exist? Certainly, Buddhism in practice has many of the same "literal versus allegorical" issues one finds in other religions. But the nature of existence is something Buddhism looks at deeply and in a different way from the way people ordinarily understand "existence." Usually, when we ask if something exists we are asking if it is "real," as opposed to being a fantasy. But Buddhism begins with the premise that the way we understand the phenomenal world is delusional to begin with The quest is to realize, or perceive, delusions as the delusions they are. So what's "real"? What's "fantasy"? What "exists"? Libraries have been filled with the answers to those questions. In Mahayana Buddhism, which is the dominant form of Buddhism in China, Tibet, Nepal, Japan and Korea, all phenomena are empty of intrinsic existence. One school of Buddhist philosophy, Madhyamika, says that phenomena exist only in relation to other phenomena. Another, called Yogachara, teaches that things exist only as processes of knowing and have no intrinsic reality. One might say that in Buddhism, the big question is not whether gods exist, but what is the nature of existence? And what is the self? Some medieval Christian mystics, such as the anonymous author of The Cloud of Unknowing, argued that it is incorrect to say that God exists because existence amounts to taking a particular form within a space of time. Because God has no particular form and is outside of time, God, therefore, cannot be said to exist. However, God is. That's an argument that many of us atheistic Buddhists can appreciate.